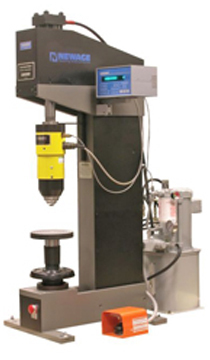 The Newage 9000N Series production tester makes a Brinell impression in conformance with the standard method for Brinell testing as described in ASTM E-10. These testers are typically used in custom applications where Newage Testing Instruments customizes this tester for the customer’s exact testing requirements. The resulting impression may be measured optically to determine the Brinell number. However, the 9000N Series automatically measures the depth of the impression, similar to the Rockwell method. The depth of the indentation method is described in ASTM E103. This technique offers users greater testing speed and reduced operator influence on test results. Like a Rockwell test, the 9000N Series applies a preload and then a major load. The depth of measurement is calculated on the difference between these loads. The 9000N Series also feature a special test reference device - a floating nose piece that surrounds the indenter and which references the surface of the specimen. This allows the tester to retain accurate readings throughout the entire load application and that is allows testing on specimens that may be out of level by up to 2-degrees. This means that castings with a normal draft angle may be tested with accurate results. Also, normal dimensional variation on parts will not adversely affect the result. The digital test head for the 9000N Series is multi-functional and may be password protected to ensure authorized operation. Dedicated keys on the test head support the functions. The depth of measurement method means faster testing, more consistent results and less operator influence that traditional optical measurements. Castings with a normal draft angle may be tested with accurate results through special test referencing device. These systems are often used as a component of an overall Brinell testing solution-engineered, manufactured and installed to your exact testing requirements. The digital test head can be configured to display the amount and degree of information for your tests- from simple to very comprehensive. Request more information to see how we can help you with a Brinell testing solution that suits your need.